Image shows product in two positions. Use it indoors or outdoors, either way our molded polyethylene Adapt-a-Bench is very versatile. It can be used as a rectangular play table, a two-seat sofa with reversible 7" and 9" seats, or as a 15" bench for adult seating. Incredible versatile these products can be used as seats, tables, or desks. 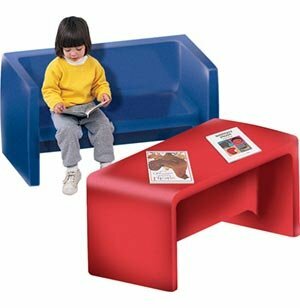 The perfect item for a busy daycare or pre-school program, the Adapt-a-Bench can spark children's imaginations. Bright red, blue, green, or yellow, the bench can be used to build or play or sit, depending on the current activity. 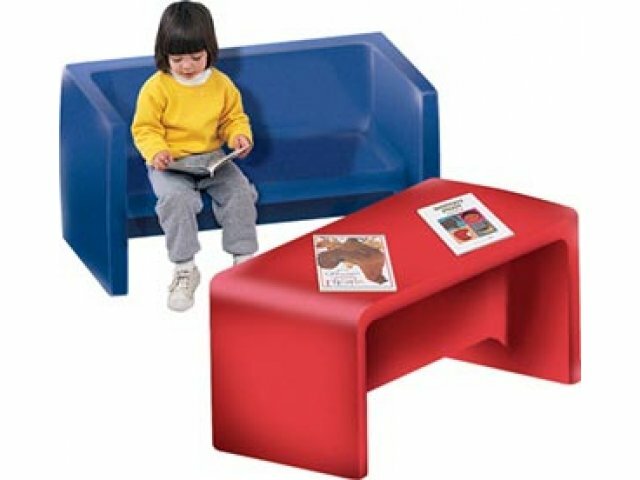 The benches are made from non-toxic plastic with rounded corners so children won't get hurt. Lightweight construction enables children to configure the bench independently. Adapt-a-Benches are designed with safety as a priority. The hard plastic will last for many years of heavy use. Whether it's learning time or play time, children's Adapt-a-Benches are great for preschool and daycare centers. Versatile: Can be used as a table, sofa with 7" or 9" seats or 15" bench. Fosters Creativity: Cubes can be used as chairs, tables, desks, or building blocks. Light enough for children to move around. Colorful: Cubes come in vibrant colors, red, blue, green, or yellow. Safe: Made of non-toxic plastic, no sharp angles or rough edges. Durable: Hard plastic is easy to clean and will last for many years. Great for indoor and outdoor use.